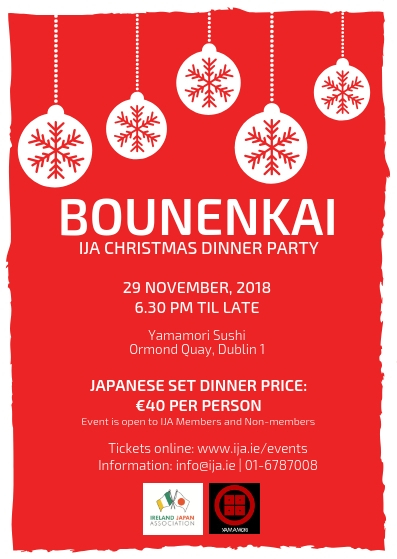 We are happy to announce that one of our most anticipated and exciting cultural events of the year – ‘Bounenkai’ IJA Christmas Dinner Party – will take place on Thursday, 29th November at Yamamori Sushi, Dublin. ‘Bounenkai’ is the way Japanese companies, families and friends celebrate the end of year together, in a casual setting. We hope you can join us for celebrations, delicious dinner and amazing evening together in a Dublin city centre venue! Event is open to IJA members & non-members. If you would like to join us for the dinner, please RSVP by Friday, 23rd November by email: info@ija.ie or call: 01-6787008.